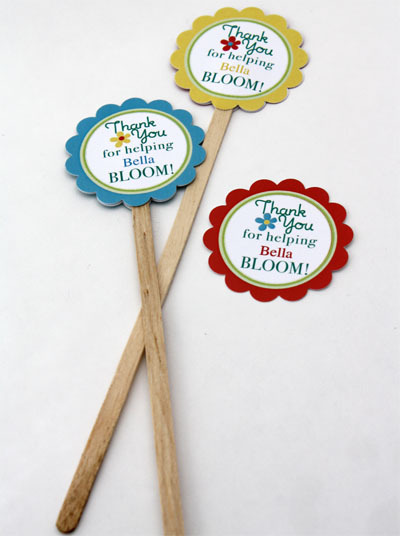 Whip these flower picks up and grab some flowers on the way to school and you are set to say thanks to a special teacher! Download the PDF, edit to add your child’s name and print on card-stock. Cut circles with a 2 inch scallop circle punch. Glue two back to back (pretty scrapbook paper can be used for the backs if you prefer) with a long wooded craft stick (or skewer) sandwiched in between. 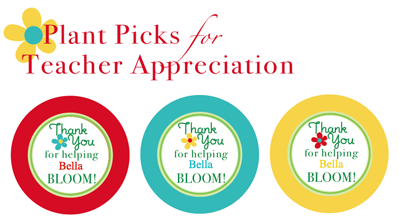 Stick your pick into some beautiful flowers and brighten your teacher’s day! Sarina, no need to order. Click on the link under the first picture. Download the file, edit to add your child's name, print in color, cut and place on stick in plant. Hope this helps. Love, love, love these tags! I can't wait to help orchestrate our 3rd grade class gift with them! Love these but where is the correct PDF? What I pulled up would not allow me to change the name. I need help, please. Want the PDF and how to change name. Thanks! I would love to be able to do this for my kids teachers but I can't seem to get it to pull up so I can print it. Hi! Found a link to your tags on Pinterest and was thrilled (well, someone else's Blog had them on there but they gave you credit- which I so appreciate!). I was out of time and energy but really wanted to thank my son's awesome teachers! This was a God-send. Thank you for choosing to make this available to download- and to edit!!! The teacher's loved it and I was thrilled to be able to give them the flowers with these custom tags!! Thank you so much for this! A real hit at my son's preschool this morning!!! What font did you use for the Thank You? Adorable! Kim, I think it is noodle script. Hope this helps! Thank you so much for sharing these cute printables! Headed to staples right now!! Thanks again! I actually stuck them one sided to the straws so they would come off easy. These are adorable. I just started freaking out about what to get the teachers this year. I love this idea! Gifts don't always have to be costly. Send quality gifts under Rs 500 ($10). Order flowers and gourmet gifts online at http://www.budsandflorets.com and relax. i absolutely love them and they worked perfectly in an appreciation gift i assembled for our son's occupational therapist. thank you for sharing your talents with all of us! hope my readers come by to discover these printable's AND your cute blog. I did this for my daughter's teachers and they were so cute! Thanks! Cindy: these turned out great! Thanks for the idea and the template! These are adorable!! I found this on pinterest and just made these to give to both of my son's teachers. It is a GREAT idea!! Thanks for sharing. I found your blog on pinterest as well, and can't wait to share this on my blog this week. Thank you so much for this wonderful idea! Found your blog via Pinterest! Just made these to give to my daughter's daycare teachers. Thanks for the great idea! These are so cute!! I just want to know if the blue box that shows up when I edit the name will also appear when it is printed. (my printer has been packed bc we are moving so before I go to kinkos I wanted to make sure). I made these last year as an end of the year thank you for my son's teachers (they all loved it)...my son attended a different school this year, so I can "cheat" and do it again ;) Thanks so much! Thanks for this great idea and the editable pdf. I used it for my son's daycare teachers.. They loved it..
LOVE LOVE LOVE LOVE this idea!! I'm totally using something like this for my daughter's teacher. So simple yet BRILLIANT! TFS! I printed this and used it in a plant for my 4th and 1st grade sons. I found a cute pot that looked like pencils. They were a hit with both teachers. I let my sons pick out the flowers to go inside. These were easy, personal, and a perfect touch! Thanks for sharing! Love these! And since my daughter is named Bella, this was a no brainer - just printed them off! :) Thanks! I used this for our Monday gift today! Thanks for the awesome ideas! If I had known, when I was sitting next to you sewing a necklace last weekend, that you were SO full of beautiful ideas, I would have picked your brain more! Your ideas make an appearance on my FB page daily! LOVE, LOVE!!! Just printed and gave your Mum printable. Can't wait to do this one next Spring. Thank you for sharing! I absoluetly love this idea and am going to make up a bunch of these for end of the year teacher gifts! Thanks so much! Thanks for such a creative and easy idea! I followed your instructions and brought in the gifts to the five (yep, 5) teachers in my daughter's kindergarten class yesterday. They loved them! Thanks for the great idea and the little signs! Thank you so much for this idea and all the ideas and printables you so generously share with us in blogland! You rock! I made a version of this using what supplies I had and hope you will come over to my blog and check it out! Thank you for this great idea and cute printable! I don't have a scallop punch, but I'm going to fly by the seat of my pants and free-hand cut the tags. Made them today but I put my own spin on them by adding button flowers and paper flowers in with the plant. Thanks for the download! Those are adorable! Definitley, going to file this one for next year! We made apple cupcakes this year! I ♥ your blog - so cute! Thanks for sharing! there is an award for you over on my blog!! Thanks for the wonderful idea and printable. I had been trying to figure out what to get my kids' teachers for Teacher Appreciation Week and was running out of time. 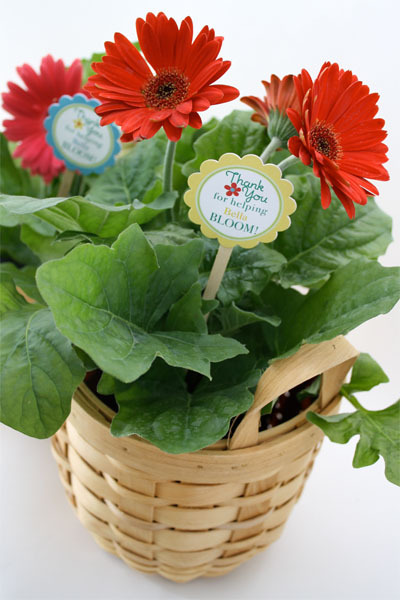 I bought small pots of gerbera daisies and put them in plastic tumblers to coordinate with your tags. They looked great and the teachers loved them! I've used several of your teacher gift ideas and they never disappoint. Hello, good afternnon! My name is Celina and I am a Portuguese teacher that absolutely loved this idea and of course it is not because of my job it is the idea itself. 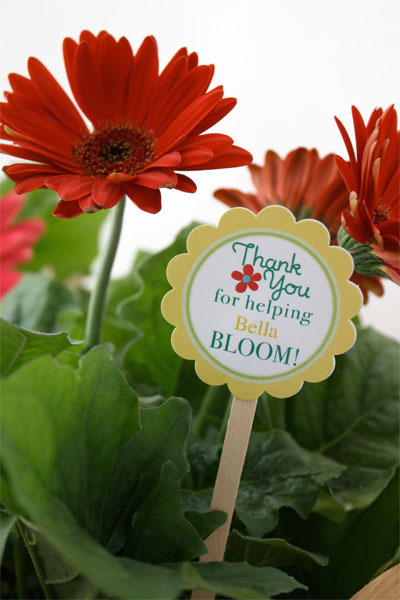 It´s a nice way to thanks someone and it can also be practical and sweet at the same time! Thank you! These are adorable!!! I will be printing tonight :) Do you know the name of the font that you used for the "Thank You" portion? whew! You just saved me!! Thanks so much!! My daughter's teacher will love this!! Thank you so much for the download, as I was racing around this morning I managed to print these out and glue them together...not as pretty as yours but fun none the less...I so appreciate you sharing! you answered my wishes with this-- BIG thank you! This is the COOLEST!!! Thanks so much for sharing. Your printables are the best!!! So cute! Thanks for sharing! Love the site and all your great ideas. These are really cute. And easy to make - my favourite! this was the answer to my prayers! thanks do much for sharing. Those are just darling, thank you so much! My girls teachers will LOVE these! This is really an adorable idea! Love this! Our PTO is spoiling us this week! Yesterday we had a TON of packaged treats in the lounge. Today more packaged treats and lunch provided. It was YUMMY! Also, parents took our kids to recess - very nice! I know we are having a breakfast on Friday. PTO has been drawing names for really nice prizes. I haven't won anything yet. I am keeping my fingers crossed!